Bronislav Gimpel: first violin , Tadeusz Wronski: second violin. Since their debut in the Wigmore Hall in London in 1963 the group has undertaken many rounds in the United States and in the whole world. Wladyslaw Szpilman was born in 1911 in Sosnowiec/Poland. On leaving school, he went to Warsaw to study music (piano) in the Chopin School of Music, under Professor Jozef Smidowicz, and later, under Professor Aleksander Michalowski (both from the famous Franz List school tradition). In 1931 he went to Berlin to the Academy of Music to study under Professor Leonid Kreutzer and Arthur Schnabel (piano) and Professor Franz Schreker (composition). At this time he wrote his Violin Concerto, Piano Suite "Zycie Maszyn" (The Life of Machines), Concertino for piano with Orchestra, many works for piano and violin and also some songs and film musics. In 1935 Szpilman entered the Polish Radio, where, except during the war, he has worked until 1963. In 1946 he published his book "Death of a City" - memories from 1939 to 1945. Since 1945 Szpilman has appeared in concerts as a soloist and with chamber groups in Poland, throughout Europe and in America. He and Bronislav Gimpel have formed a very successful piano duet (since 1934), which grew in 1962 to "the Warsaw Piano Quintet ", that performed about 2500 concerts until 1987 in whole world with exception of Australia. Since 1936 he started also his career as a composer of songs (about 500). About 150 of them were in a pop-charts of Poland and they are until today "evergreen's" of a polish popmusic culture. In the 50`s he wrote about 40 songs for children, for which he received in 1955 the award of the Polish Composers Union. He wrote also some orchestral pieces (Ballet, Small Overture a.o. ),musicals,music for children theater and a music for about 50 children radio broadcast, as well as film music 1937- "Wrzos", 1939 - "Dr. Murek", 1950- "Pokoj zwyciezy swiat", 1957- "Call my wife" a.o. In 1961 he initiated and organized International Songs Festival in Sopot - Poland also founded Polish Union of Authors of Popular Music. Since 1964 he was member of Presidium of Polish Composers Union, and ZAIKS (Polish "ASCAP"). Bronislaw Gimpel born in 1911 Lwow/Poland, started piano and violin lessons with his father at the age of five. At the age of eight, he studied with Moritz Wolfstahl at the Lwow Conservatory. After 1922 he continued his studies with Robert Pollack at the Vienna Conservatory. At the age of fourteen, he played the Goldmark Concerto with the Vienna Philharmonic. A year later, an extended concert tour in Italy resulted in a succession of triumphs of historic proportion, with command performances before the King Vittorio Emanuele III and Pope Pius XI, and invitations to play on Paganinis famous Guarneri and to perform at the grave of the legendary virtuoso. Tours of South America and Europe followed. 1930 he attended the Berlin Hochschule für Musik under the guidance of Prof. Karl Flesch. Thereafter he continued his solo career while holding the lead posts in Könisgberg and Göteborg. The outbreak of the War brought Gimpel to Los Angeles and to the concertmastership of the L.A. Philharmonic. After serving in the U.S. Army from 1942 to the end of the War, Gimpel resumed his solo career in Europe, where he was received, once again, with great acclaim. 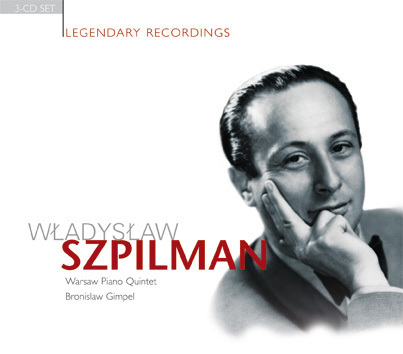 In 1962, he and Wladyslaw Szpilman formed "The Warsaw Piano Quintet". In 1967 Gimpel accepted a professorship at the University of Connecticut. From 1973 Gimpel was a Professor at the Royal Northern College of Music in Manchester, England. In this period of time he resumed his solo concert appearances in Europe, USA and South America. Bronislaw Gimpel died in Los Angeles in 1979. Tadeusz Wronski (1915-2000), an exceptional violinist and simultaneously one of the world's most famous violin teachers. He graduated from the Warsaw Conservatory in 1939, where he studied under professor Jozef Jarzebski. In 1947-48 he continued his musical education under professor Andre Gerttler at the Brussels Conservatory. In 1949 he became a professor at Warsaw's Higher School of Music. Later he taught for a time at the largest music college in the United States, the Indiana Bloomington School of Music (1967-84). During his career, he educated over five hundred violinists. 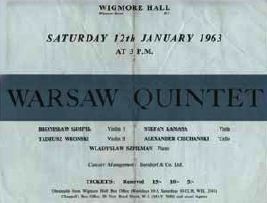 As a performer, Wronski appeared as a soloist, in a duo with Wladyslaw Szpilman and was a member (1962-67) of the The Warsaw Piano Quintet. Stefan Kamasa, born in 1930, studied viola in Warsaw under Tadeusz Wronski and 1957-58 in Paris with Pierre Pasquier. Solo performances with orchestras include the London Royal Philharmonic, l'Ochestre Nationale de France, Warsaw Philharmonic, Mozarteum Orchester, RSO Berlin, and Dresden Philharmonic. Leading Polish composers have written concertos for him, including Penderecki, Baird, and Bacewicz. He joined the Warsaw Academy faculty in 1980. He was Member of "The Warsaw Piano Quintet" from 1962-1986. Aleksander Ciechanski, born 1927, made his concert-debut when he was fourteen. In 1954 he graduated from the Krakow Academy of Music. He performed as a soloist with many Symphony and Radio Orchestras and recorded for the Polish Radio and Television and the Polish State Record Company. Since 1962 he was a Principal Cellist of the National Philharmonic of Poland. In 1967 he became a member of the St Louis Symphony Orchestra. He did several solo performances with various orchestras in the USA and was teaching cello at the St Louis Conservatory. Two impressive piano quintes, one normal in length, the other vast and spreading, both highly charged with emotion, occupied the first part of a recital given in Wigmore Hall on Saturday afternoon by the Warsaw Quintet. This is a remarkably fine and true ensemble led by Mr. Bronislow Gimpel and having a commanding pianist in Mr. Wladyslaw Szpilman. They are all excellent players, fully mature and very possessive of the music they decide to play. They give in their best attention and, it may be said, no quarter, for they are nothing if not outspoken in their interpretation. 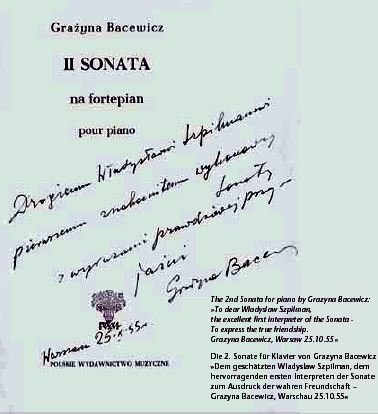 The first work, by the contemporary Polish composer Grazyna Bacewicz, was interesting and sometimes moving. It also was vociferous in a romantic manner. One had the impression that its creator may well have seen things happen that she would not talk about but felt she must put into sound. The second work was Bloch's sprawling quintet. It is seldom heard, perhaps because it demands so much of the hearer that players realize that they must not dispaly it often. What it also demands is expert and rather ruthless players who can pile on the emotion without wilting. This is what took place when these five players expressed with the utmost energy Bloch's intense visions and acted as battering ram on the feelings of us who listened. It was altogether a great performance and at long last the overpowering spirit of the music subsided into beautiful repose though by then one was too bewildered fully to savour this release of tension. Lastly came Dvorok's quintet. Though the interval had not been long enough to allow the players to relax after the Bloch, the first movement was finely done and brought welcome relief. Each player is a soloist in his own right, but they are so well integrated that the ensemble playing results in tender music of the highest order. The whole concert served to remind one that perfection in performance can be achieved only trough persistent and ardous rehearsal and a refusal to accept anything but the best. The Warsaw Quintet which is excellently equipped in all departments of the art of playing chamber music has one more advantage- maturity. Hong-Kong, South China Morning Post, 23.5.1964. The Brahms Quintet was the highlight of the evening, for its strengh and virility suited the players (all men), who interpreted its power and passion with nobility and depth. 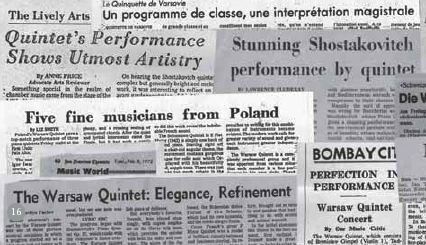 Top Rate Performances given by the Warsaw Quintet in Tokyo. Each of the members of this ensemble, which rightly in Europe enjoys a high reputation, is obviously extremely intelligent and their teamwork is excellent. The Warsaw Quintet is composed of five first rate musicians, each a master of his instrument. They are a particularly well coordinated group and they have an unsually beautiful sonority. a rich string tone that seems to make the instruments grow larger, a tone heart almost uniquely among Slavic string players. The first day of the festival. ...An excellent ensamble with a true feeling for chamber music and a great ease. During the hole concert we enjoyed this disciplined and lively performance. The five polish musicians are people on a high artistic and technical level. ...WARSAW QUINTET IS A PERFECT CHAMBER-ENSEMBLE! ,,A memorable concert from The Warsaw Quintet"
The Warsaw Quintet is brilliant"! Un bel, ensemble en verite, qui nous a cause la plus agréable surprise... Les maitres d'une impeccable technique digitale. ... la plus parfaite harmonie des talents.. Nombreux auditoire, visiblement captivé par cette brillante audition. Igor lwanow 1-er violon, Jan Tawroszewicz 2-eviolonSlefan Karnasa alto, Andrzei Orkisz violoncelle, Wladyslaw Szpilman piano. Un ansemble foul a fait remarquable! Chez les cordes, des techniques parfaitement équilibrées, un soin exfréme de la justesse, des sonorites remarquablement fondues et affront par lá un plaisir constant a l'oreille; et chez chaque exécutant une chaleur, un don de soi de chaque instant, soucieux pourtant d'un ~ct olignement avec ses partenaires. Un pianiste, enfin, dont le, jeu vivant, se mé1e au mieux á 1'ensemble sans jamais le couvrir. A VITALITE ROMANTIQUE DU QUINTETTE DE VARSOVIE"
... Pubblico numeroso. Accoglienze entusiostiche ai "magnifici cinque" di Vorsavia, che. Presentatisi per la prima volto a Milano. Hanno conquistato di colpo le simpatie die nostri musicofili. ... 11 Quintetto di Varsovia, é un complesso di eccezionale volore. Sonoritá purissime dei signoli strumenti si adunano in vigoroso unitá, omogenea, inscindibile, di organica compiutezza. I1 trapasso dalla delicatezza sonora di indicibili sfumature, in graduali cahgiamenti, al prorompere della luce solare del "forte", é di una potenza rivelatrice avvolgente. Cinque strumenti, cinque anime in una, vanno diritti all'essenziale, in una perfezione di suoni che perfezione di forma. Essecuzioni come questo offerto dal Ouintetto di Varsavia non sono, non possono essere frequenti. Successo alla Scarlatti del Quintetto di Vorsavia. Quintetto di Varsavia é un insieme strumentale di prim' ordine. Lo que mas impresiono del conjunto su perlecto acoplamiento su sensibilida~ )an exquisita para frasear cada pasaie y ei mäs emotivo equilibrio de las sonoridades que die a esta obra una interprefacion verdaderamente ei publico clarnorosas ovaciones. ... Se presento el Quintefo de Varsavia (lgor lwanow primer violin, Jan Tawroszewicz segundo violin: Stelan Karnaso viola: Andrzei Orkisz cello: Wladyslaw Szpilman piano) El estupendo grupo polaco - porque verdaderamente es estuperdo - inicio su intervencion con el Quinfeto para piano y cuerdas Op. 57 de Schostakowicz, con el que demostro admirable comprension musical y poderosa vitalidad. Con alarde de sonoridad inusitada, cada ejecutante logro dentro de un marco unitario con siso y de riguroso discipline, la subordinacion mas asombrosa imaginable fonto a to parlitura como a t resto de sus companeros. Wladyslaw Szpilman wurde am 5. Dezember 1911 im polnischen Sosnowiec geboren. Nach ersten Klavierstudien in Warschau setzte er seine musikalische Ausbildung von 1931 bis 1933 in Berlin bei Leonid Kreutzer, Arthur Schnabel (Klavier) und Franz Schreker (Komposition) fort. Nach der Machtergreifung nach Warschau zurückgekehrt, machte Szpilman sich schnell einen Namen sowohl als Pianist als auch als Komponist ernster und unterhaltender Musik. Seit 1935 arbeitete er für den Polnischen Rundfunk, bis seine Karriere mit dem deutschen Einmarsch in Polen ein abruptes Ende fand. Anders als seine Familie, die in Treblinka umkam, entging Szpilman auf wundersame Weise der Deportation und überlebte, unterstützt von Freunden, zunächst versteckt im Warschauer Untergrund, dann zwei Jahre lang in den Trümmern Warschaus auf sich allein gestellt und schließlich mit Hilfe eines deutschen Wehrmachtsoffiziers. Die Erlebnisse während der Kriegszeit verarbeitete Szpilman bereits 1945 in einem Buch, um dann für Jahrzehnte kaum mehr darüber zu sprechen. Seine Erinnerungen, 1998 in Deutschland wieder veröffentlicht und seither in viele Sprachen übersetzt, dienten als Vorlage für Roman Polanskis 2001 entstandenen, mit der Palme dOr und drei Oscars prämierten Film "Der Pianist". Nach Kriegsende kehrte Szpilman an den Polnischen Rundfunk zurück, wo er bis 1963 die Musikabteilung leitete. Zugleich war er Kammermusikpartner von höchstrangigen Geigern wie Henryk Szeryng, Roman Totenberg, Ida Händel, Tadeusz Wronski und Bronislaw Gimpel, mit dem er das Warschauer Klavierquintett gründete. Szpilman trat als Konzertpianist und Kammermusiker in Polen, in ganz Europa und Amerika auf. Auch an seine Erfolge als Komponist konnte er nach dem Krieg anknüpfen. Zu Szpilmans kompositorischem Schaffen, das in seinen Berliner Jahren seinen Anfang genommen hatte und das er selbst während der Zeit im Warschauer Ghetto nicht aufgab, zählen symphonische und konzertante Werke, Klaviermusik, aber auch zahlreiche Hörspiel- und Filmmusiken und rund 500 Lieder und Schlager, von denen viele noch heutzutage in Polen populär sind - sie brachten ihm das Attribut des "Cole Porter, Gershwin, McCartney Polens" ein. Bronislaw Gimpel, geboren in 1911 in Lwow/Polen, bekam ersten Klavier- und Violinunterricht im Alter von fünf Jahren bei seinem Vater. Ab dem achten Lebensjahr studierte er am Konservatorium von Lwow bei Moritz Wolfstahl, 1922 dann am Wiener Konservatorium unter Robert Pollack. Im Alter von 14 Jahren spielte er mit den Wiener Philharmonikern das Violinkonzert von Goldmark. Ein Jahr später feierte er triumphale Erfolge bei einer Italientournee mit Auftritten u. a. vor König Vittorio Emanuele III. und Papst Pius XI. Gimpel spielte auf Paganinis berühmter Guarneri und gab ein Recital am Grab des legendären Virtuosen. Es folgten Konzerte in Südamerika und Europa. Ab 1930 studierte er bei Karl Flesch an der Berliner Hochschule für Musik. Danach setzte er seine Kariere als Solist, wie auch Konzertmeister in Königsberg und Göteborg fort. Bei Ausbruch des 2. Weltkrieges ging Gimpel ins Exil in die USA, wo er Konzertmeister der Los Angeles Philharmoniker wurde. Nach seinem Dienst in der US Army (1942-45) setzte er seine Solokariere mit großem Erfolg in Europa fort. 1962 gründete er zusammen mit Wladyslaw Szpilman das "Warschauer Klavierquintett". 1967 folgte Gimpel einem Ruf als Professor an die Universität von Connecticut. 1973 wurde er Professor am Royal Northern College of Music in Manchester/England. In dieser Zeit gab er eine Reihe von Konzerten in Europa, Südamerika und in den USA. Bronislaw Gimpel starb 1979 in Los Angeles. Tadeusz Wronski (1915-2000), ein herausragender Geiger und weltberühmter Geigenpädagoge, studierte bis 1939 am Warschauer Konservatorium bei Josef Jarzebski. Er setzte seine Ausbildung in den Jahren 1947 bis 1948 am Brüsseler Konservatorium bei Andre Gerttler fort. 1949 übernahm er eine Professur an der Hochschule für Musik in Warschau, zwischen 1967 und 1984 lehrte er an der Indiana Bloomington School of Music. Während seiner pädagogischen Laufbahn unterrichtete er über 500 Geiger. Als Interpret trat Wronski als Solist, wie auch im Duo mit Wladyslaw Szpilman und später (1962-67) mit dem Warschauer Klavierquintett auf. Stefan Kamasa, geboren 1930, studierte Bratsche in Warschau bei Tadeusz Wronski und 1957-58 in Paris unter Pierre Pasquier. Er trat als Solist mit dem London Royal Philharmonic, l'Ochestre Nationale de France, Warsaw Philharmonic, Mozarteum Orchester, RSO Berlin, und den Dresdener Philharmonikern auf. Führende polnische Komponisten wie Penderecki, Baird und Bacewicz schrieben für ihn Konzerte. Ab 1980 wurde er Hochschullehrer an der Warschauer Akademie für Musik. 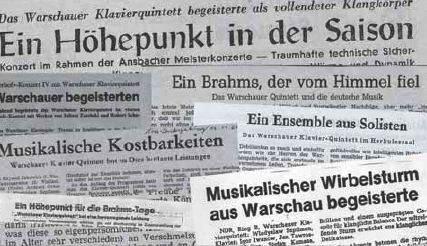 Er war Mitglied des "Warschauer Klavierquintetts" in den Jahren 1962-1986. Aleksander Ciechanski, geboren 1927, spielte sein erstes Konzert im Alter von 14 Jahren. 1954 absolvierte er die Krakow Akademie für Musik. Er trat als Solist mit vielen Symphonie- und Rundfunkorchestern auf und machte in Polen Aufnahmen für Rundfunk und Fernsehen, sowie für die staatliche Schallplattengesellschaft. 1962 wurde er Konzertmeister der Nationalen Philharmonie in Polen. 1967 wurde er Mitglied des St. Louis Symphony Orchestra. Er unternahm einige Solokonzerte mit verschiedenen Orchestern in den USA und unterrichtete Cello am Konservatorium in St. Louis. Daß ein international renommierter Geiger sich an die Spitze eines Kammermusikensembles stellt, ist im Zeitalter des Starkults ungewöhnlich. Künstler wie Schneiderhan und Vigh ließen bekanntlich Ihrer Solistenkarriere wegen ihre berühmten Streichquartette in die Brüche gehen. Bronislav Gimpel gründete demgegenüber vor einigen Jahren in Warschau ein Quintett, einzig um die nicht einmal umfangreiche Literatur für Klavierquintett zu pflegen. Mit dem 2. Geiger Tadeusz Wronski, dem Bratscher Stefan Kamasa, dem Cellisten Alexander Clechanski und dem Pianisten Wladyslaw Szpilman stellte er sein Ensemble nunmehr im Rahmen der Städtischen Kammermusiken in Aachen vor, und wie so oft, wenn Musiker aus dem Osten konzertieren, erlebte man ein Musizieren von hinreißendem Feuer, leidenschaftlichem Engagement und ausgepichtester Perfektion des Technischen. zirkushaften, aber entwaffnend originellen Scherzi, wie sie für den sowjetischen Komponisten typisch sind. Halten wir uns also an die beiden Hauptwerke des Abends, Schumanns überquellendes, von nie abreißender Inspiration und feurigem Schwung getragenes Es-DurQuintett op. 44 und Brahms' Klavierquintett f-moll op. 34. Gemeinsam ist beiden Werken der durch die Vollgriffigkeit des Klavierparts bedingte Zug zu sinfonischer Klangfülle, zu einem großräurnigen Alfresco. Gemeinsam ist dem reifen Schumann wie dem jungen Brahms die Unmittelbarkeit der expressiven Aussage, die männliche Kraft des Ausdruckshaften. Diese Charakteristika stehen denn auch im Vordergrund der Deutung durch Gimpel und seine Musiker. Der große Geiger gibt sich übrigens keineswegs als tonangebender Star, man hat sogar manchmal das Gefühl, daß er dem vitalen Vollblutpianisten die Führung abtritt. Er kann dies um so bedenklicher wagen, als die herrlich gespannte, so kraftvolle wie differenzierte und satte Tongebung der Streicher auch dem ungehemmten pianistischen Brio standhält, Es ist ein Musizieren aus dem Vollen, ob der Cellist das Seitenthema des Schumannschen Kopfsatzes in wundervoller Sonorität aussingt oder ob es gilt. dem dahinjagenden Doppelfugato am Schluß dieses Werkes polyphone Plastik und größte dynamische Schlagkraft zugleich zu geben. Die Tempi werden fast rhapsodisch frei gehandhabt. alles Klassizistische bei Brahms ist unterdrückt zugunsten einer Intensität des Details, das sich weniger aus der Logik des architektonischen Aufbaus als aus dem verzehrenden Impuls des Musizierens heraus zum Ganzen zusammenfügt, Kein Ensemble minderen Ranges könnte sich diese Freiheiten straflos erlauben. Aber hinter diesem scheinbar Improvisatorischen steht ein Höchstmaß an bewußter künstlerischer Formung und klanglicher Organisation. Ein Ensemblespiel von solcher Vollkommenheit, daß man hinter der verzehrenden Kraft der Aussage die Arbeit nicht mehr spürt. Der Beifall ist überaus herzlich, und freigebig danken die Warschauer mit zwei Zugaben: dem schon erwähnten Schostakowitsch und dem Scherzo aus dem Klavierquintett von Dvorak. Kammermusik, durchweht von der Luft des großen Konzertsaales. Eine künstlerische Begegnung, die man so schnell nicht vergißt. Höchste virtuose Meisterschaft. Das Warchauer Quintett - ein erlesener Kunstgenuss. Die polnischen Gäste boten einen Kammermusikabend mit lebhaften Farben und kontrostreichen Stimmungen, wie man ihn in änlicher Unbefangenheit lange nicht erlebt hat. Warschauer Quintet begeisterte Zuhörer in Schloss Marsbraich. Dieses Ensemble zeichnet sich in der Tat durch in vieler Beziehung einmalig zu nennende Qualitäten aus. Mit der Vorfreude auf das um einige Mo-nate verschobene 10.Meisterkönzert, das in Zusammenarbeit des Meisterkonzert-Verann-stalters mit dem Bielefelder Städtischen Orchester und seinem Leiter Bernhard Conz unter der Mitwirkung des namhaften Solisten- ehepaares Seefried/Schneiderhan den neuen Konzertwinter mit einem bedeutsamen Pro-log eröffnen wird, ging die Meisterkonzert-reihe jetzt vorerst zu Ende: Das Warschauer Quintett mit dem berühmten Geiger Bronis-law Gimpel als Primus inter pares seiner Quintettpartner von Rang und Namen, Ta-deusz Wronski (2. Violine), Stefan Kamasa (Viola), Alexander Ciechanski (Violoncello) und Wladyslaw Szpilman (Klavier), erspielte sich das berühmte Klavierquintett mit vollendeten Interpretationen von Schumann (Es-Dur, op. 44) und Brahms op. 34 einen einhelligen Erfolg, einen Erfolg, der gleichermaßen auf tiefgehender, werkeigener und mitreißend musikalischer Gestaltung beruhte, wie er ebenso mit extellentem technisch-virtuosem Einsatz zustande kam und dem sich schließlich das rege Interesse an einem polnischen Gegenwartswerk von Grazyna Bacewicz als spezieller Akzent beigesellte. Fünf Künstler, fünf Instrumente, fünf Persönlichkeiten von geistiger und seelischer Individualität so zusammenzuschmieden, daß derart geschlossene, nahtlose Interpretationen verwirklicht werden können, ist etwas außerordentlich Seltenes, zumal ein Klavierquintett zusätzlich noch die Hürde der Verschmelzung von Streichquartett- und Klavierklang zu überwinden hat. Hier im Warschauer Quintett fand sich alte Musikkultur und -ästhetik mit moderner, weltgültiger Perfektion. Das Ergebnis ist einmalig, und es steht wohl zweifelsfrei fest, daß die Weltberühmtheit dieses Ensembles seine künsttlerische Sonderstellung voll und ganz dokumentiert. Viele werden sich vielleicht an den Abend vor rund zehn Jahren erinnert haben, als der berühmte Geiger Bronislaw Gimpel mit dem Städtischen Orchester unter Bernhard Conz das Violinkonzert von Britten für Bielefeld erstaufführte. Inzwischen war der seit längerem ebenso berühmte Pianistenbruder Jakob Gimpel einige Male hier, von dem Bronislaw damals so Rühmendes aus Amerika zu berichten wußte. Der hiesige Erfolg mit Brahms "Klaviersinfonie" übertraf dann alle seine Voraussagen. Unser damaliger Vorschlag an Jakob Gimpel, zusammen mit Bronislaw einmal mit einem Violin-Klavierabend hierher zu kommen, fand trotz seiner begeisterten, Aufnahme dieses Wunsches leider bisher noch keine Verwirklichung. Die Künstler des Warschauer Quintetts begannen mit einem Opus ihrer Landsmännin Grazyna Bacewicz und schenkten das Vermögen ihrer überwältigenden interpretierenden Gaben diesem Werk, das zwischen impressionistischen. Farben, gefühlsbetonten Ausdruckswerten und profiliertem Eigenklang respektvolle Anerkennung abnötigte. Die ersten starken Eindrücke packten die Hörer mit Schumanns herrlichem, ausdruckgesättigtem Werk, in dem Schumann den glänzenden Klavierpart seiner Frau Klara "auf die Hände" geschrieben hat. Zwischen dem wunderbaren Verstehen aller Künstler, schwingend zwischen dem oft konzertmäßigen Elan des Klavierpartes und den leuchtenden Farben der Streicher erwuchs es sich in seinem spannungsträchtigen, von Schumann stellenweise so kammermusikafisch fein sublimierten und dann wieder so männlich energievoll-beschwingten Fluß zu vollendeter Schönheit von Musikalität, Innigkeit und gestaltender Kraft. Den Höhepunkt des Abends brachte die grandiose Interpretation des f-Moll-Klavier quintettes von Brahms. In dem Pianisten Wladyslaw Szpilman fand das Werk für den gewichtigen Unterbau des schweren Klavierpartes die Physisch und geistig souverän durchdringende Kraft und die starke Inspiration zur Gesamtgestaltung, an der die hellschwingend musizierenden Geigen, der samtweiche Wohllaut von Bratsche und Cello in ganzer künstlerischer Hingabe zur Vollendung mitschufen. Ein grandioser, tiefer Eindruck von mitreißender Faszination. Die Beifallskundgebungen, von Begeisterung und Anerkennung angetrieben, waren anhaltend und sehr herzlich. Warschauer Quintett begeisterte im letzten Koncert. Von Gelsenkirchen nach Lindau, von Lindau nach Essen. So große Sprünge machte das Warschauer Quintett an drei Tagen hintereinander, mit dem Erfolg, daß man im Kammermusiksaal über eine halbe Stunde warten mußte, weil die fünf Herren am Bodensee den richtigen Zug verpaßten. Als sie dann glücklich eintrafen, erlebte man einen der schönsten Kaminermusikabende der Saison. Eigens zum Klavierquintettspiel haben sich die polnischen Musiker unter Führung des auch bei uns schon löblich bekannten Geigers Bronislaw Gimpel zusammengefunden. Nicht also ein Streichquintett, zu dem hier und da ein Pianist mit vorlautem Geltungsbedürfnis stößt, wie man es gelegentlich erlebt, sondern Spezialisten. Der Mann am Klavier mit dem musikintensiven Namen Wladyslaw Szpilman gehört sozusagen ex ovo dazu, was die Gewißheit bedeutet, daß seine Stimme in der wunderbaren Harmonie des Ganzen mit absolut gleichgewichtiger Resonanz zur Geltung kommt. Der Gipfel an kammermusi-kalischer Perfektion also? Das auch und nochmehr dazu; der Geist der Musik, der die Welt hinter den Noten auftut, der bei Brahms (Klavierquintett f-Moll op. 34) Überschwang und Melancholie in blühender In-strumentalromantik und sensibler Dynamik erklingen läßt und bei Dvorak (A.Dur op. 81) mit der organischen Geschlossenheit des Musizierens die persönliche Stimmungslyrik der vier Sätze, zumal des als Dumka bezeichneten Andantes hinreißend lebendig macht. Es bleibit nicht verborgen daß Bronislaw Gimpel der spiritur rector dieser verfeinerten, vertieften und dabei urgesunden Vortragseinhelligkeit ist. Tadeusz Wronski am zweiten Pult, Stefan Kamasa als weich und sonor intortierende Bratscher und Alexander Ciechanski, der blendende Cellist sind seinen Intentionen bedingungslos verbunden, desgleichen natürlich der tempera mentvolle Pianist, ein Meister von höchen Graden. Da konnte es nicht fehlen,daß das Publikum hochbegeistert war, und die Warschauer nicht ohne Zugabe ziehen ließ. Das Warschauer Klavierquintet (Igor lwanow, Jan Tawroszewicz Violine, Stefan Kamasa Bratsche; Andrzej Orkisz Cello; Wladyslaw Szpilman Klavier) kam nach München und brachte zwei Kammermusikalische Reiser mit: Schuman und Dvoraks Klavierquintette. Der zweite Satz von Schumanns op. 44 atmete zarte Romantik. Die Warschauer fanden genau den richtigen Ton. Dvorak op. 81 geriet zum herrlich vollen Abschlus. Der stürmüsche Beifall am Schluss wurde mit dem Scherzo von Schostakowitsch belohnt. van in der Tongebung sehr fein sinnigen ersten Geiger Igor Iwanow gepragt war. Selten sind Debütanten so rasch und einhellig akzeptiert worden wie die Herren des Warschauer Klavierquintets, die sich erstmals im Herkulessaal vernehmen liessen. Trotzdem oder gerade weil sie Gegensätze im Musiziertypus wie im Alter sind, bilden sie ein vortreffliches Ensemble, das sich selbst im wildesten Rubato keine Unstimmigkeit zuschulden kommen läst. der Hand: das Paradebeispiel eines Virtuosen der den sechsten Sinn für das Kammermusikalische hat. Schummanns Kiavierquintett erschien als ein feuriges und schwürmerisches Wer k. Sogar der knorrige Kontrapunkt des Final hatte Leichtigkeit und Nüancen. Die Freiheit und Gelöstheit, wie sie das Merkmal der Meister sind trugen genauso Dvoraks A-Dur-Quintett. Grosszügig wurden die Themen aufgebaut, nervig die Steigerungen angelegt und mit Delikatesse der Soli ausgespielt. Feinschliff und breite Bögen, die beiden kommermusikalisch Kardinaltugenden, waren in eins gefasst. Man hörte einen äusserst sensiblen und zuglei ch äusserst temperamentvollen Dworak. Das Warschauer Klavierquintett fesselte, ja, begeisterte im gutbesuchten Sendesaal des Funkhauses Hannover vom ersten bis zum letzten Ton. Klavier und Streichinstrumente verbinden sich zu einer Homogenität, zu einer feurigen Schwungkraft des Musizierens, zu einem Klangkolorit, daß Man in jedem Moment spürt, diese fünf Musikanten sind seit langem zu einer kammermusikalischen Gemeinschaft zusammengewachsen. Wie ein musikalischer wirbelsturm fwgte das Warschauer Klavierquintett durch sein Programm... ...starke dynamische Spannung prägt das Spiel der Warschauer, das mit ungeahnter Energie zu noch größeren Spannungen fähig ist. Dabei ist ihr Spiel geschlieffen bis ins feinste Detail, Nebenstimmen trreten bis zur Unhörbarkeit zurück, wodurch die formale Gliederung mit fein ausgewogwnwn Übergangen deutlich hörbar wird. Jeder der fünf Partner vereint musikantisches Feuer mit technischer Brillanz und einem ausgeprägten Gespür für klangliche Balance. Der mitreißende Sturm erwächst aus klanglicher Delikatesse. Am Freitagabend begeisterte das Warschauer Klavierquintett im vierten Schweizerhof-Konzert mit Werken von Jullusz Zarebski und Robert Schumann. Obschon das Warschauer Klavierquintett (Wladyslaw Szpilman Klavier; Krzysztof Jakowicz, 1. Violine; Jan Tawroszewicz, 2. Violine; Stefan Kamasa, Viola und Andnej Orikisz, Cello) schon vor 18 Jahren gegründet worden ist, ergab sich erst jetzt die Gelegenheit diesem aussergewöhnlichen Ensemble zu begegnen, Der ihm vorausgegangene gute Ruf wurde durch das Auftreten in Luzern vollauf bestätigt. Es hält schwer, die Akzente der Bewunderung richtig zu setzen. War es die wundervolle Transparenz der Werksgestaltung, war es die tadellose Präzision des Zusammenspiels oder lag die Wirkung in Intensität, mit der die beiden Werke und der starken Empfindung- und Ausdrucks- die Zugaben dargeboten wurden? Der Pole Juliusz Zarebski starb 1885 im Alter von 31 Jahren. Er war Schüler von Franz Liszt, als Pianist überaus erfolgreich und in den letzten Lebensjahren Leiter der Meisterklasse am Konservatorium von Brüssel. Sein kompositorisches Schaffen ist nur in engsten -Fachkreisen bekannt. Man sucht seinen Namen beispielaweise vergeblich im bekannten Musiklexikon von Ritmann. Das Klavierquintett op. 34 erwies sich als eigentliche Trouvaille. Wohl spürte man dass ihm Chopin und Liszt zu Gevatter standen, doch weist es durchaus eigenständige, faszinierende Züge auf. Der erste Satz enthielt schwelgerische Partien mit leidenschaftlichen Klangballungen. Das Klavier wechselte zwischen Führungsaufgabe und Begleitfunktion. Apart erwies sich die zweifache Verlangsamung des Hauptthemas durch das Cello. Im Adagio brillierte, die erste Violine mit einem prächtigen Gesang. Das elegische Scherzo, wartete mit seltsamen Klangwirkungen auf, und das Finale zeigte tänzerische, und liedhafte Elemente, die sich zu kraftvoller Ballung steigerten. Die Wiedergabe des an musikadischen Gedanken und kompositiorischen Finessen reichen Klavierquintetts Es-Dur, op. 44, von Robert Schumann erfüllte höchste Erwartungen. Der brillante Planist stand den Streicher ebenbürtig zur Seite etwa in derwundersamen Intonation des zweiten Themas im Kopfallegro, in den jagenden Triolen des zweiten Satzes oder im Doppel-Fugato des Finales. Die Streicher entfalteten zarteste Pianissimi glutvolle Kantilenen oder erregende Steigerungen bis zu orchestraler Klangfülle. Alles vollzog sich in gestalterischer Übereinstimmung, konsolidierter Virtuosität und feinen dynamischen Stufungen. Die vom begeisterten Publikum förmlich erbettelten Zugaben bewiesen, dass sich das polnische Quintett auch in der modernen Tonsprache bestens auskennt, so bei Grazyna Bacewicz , und Dimitri Schostakowitsch. Es folgte noch das als Furiant wirbelnde Scherzo aus Antonin Dvoraks Klavierquintett op. 81. Concerthall / Switzerland 1963 : Records - Quintets of Brahms, Dvorák and Boccherini. 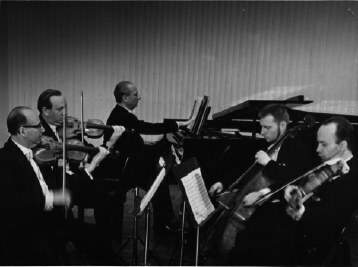 1962 : Quintets of Zarebski, Shostakovitch, Schumann. You will find many recordings bei BBC (London), most of German Radiostations and also in the USA and Japan.